Speaking out against your current manager, and saying nice things about your former manager, is not necessarily the best thing to do, even if you are on something over £8m a year salary. There’s bound to be a pesky clause in your contract that says you can’t do that sort of thing. And of course when something is reported in a newspaper there is no telling what was actually said. Was anything said at all? And what was the translation like? I can remember issues relating to Bendtner where eventually the newspaper in question had to apologise, although the apology was, in the traditions of the English press, about one percent of the size of the original article, and hidden away in a 6 point font at the foot of the racing results. Anyway, S. Nasir Esq has seemingly spoken out, and unless he denies it I guess we take it as true. Last season Mr Nasri was good in parts, and not playing every game, (and certainly not one guaranteed a place in the starting XI), and this season it is said that when he has been picked he has been erratic. To be fair, Mancini said that this did not apply just to Nasri, but to quite a few members of his elite squad, and that a fair number were only make half the effort that they should. It is an interesting way to go about running a club – putting your own players down in public – and certainly not one that you ever hear coming from Mr Wenger and his team. When he drops a player he puts forward clear and positive reasons why, relating to the number of games played, the pressure, the tension, the player’s age… whatever. None of this “he wasn’t making the effort so we dropped him” stuff. “Wenger is the best coach I’ve worked with. I only regret not having more discussions with Arsène Wenger when I left. He’s the one who understood me the most and made me the player I am. I’m thankful. Well actually, and I know it is a tiny detail, but I like to get these things clear, Man City won the league while Arsenal came third. Tottenham came fourth and didn’t get into the Champions League. Now I don’t quite understand all that, but there is no doubt that behind all of this chit-chat is Jean-Pierre Bernes, Nasri’s “advisor”. Bernes was the “advisor” and some to Marseille’s Bernard Tapie when the two men were found guilty of fixing the Ligue 1 match against Valenciennes in May 1993. During the trial Bernes said Marseille had spent “more than £600,000” on corrupting the match. Bernes went to prison and was banned from French football. Uefa banned Marseille from the Champions League (which it won straight after the fixed league match) and the club had its title removed as was relegated. Now this is important because just at that moment the top challenger to Marseille was Monaco managed by Arsène Wenger. The Valenciennes coach was Boro Primorac, who now works as assistant to Mr Wenger. Boro P testified in court against Bernes. Now years later Bernes, known as the most powerful man in French football, did allow his man to go to Arsenal, but then whipped him off to Man City. In a further twist, Nasri claimed this weekend that Arsenal was forced to sell him to City in 2011 by the club’s owner Stan Kroenke. Now that seems very odd, because there has never been a whiff of this story anywhere at the time (well, not in any serious newspaper anyway). What seems much closer to the truth is that Nasri refused to sign an extension to his contract, and with just one year left, was sold to avoid him going for nothing. Arsenal certainly did make a very good profit on a man who, according to press reports, his new manager has now said is worthy of a punch. If we do want to speculate, I would say that we see the hand of Bernes in all matters relating to Nasri, and he’s now manipulating the situation to get Nasri sold again, so that both parties can pick up a good transfer fee. We made a tidy profit on Nasri…..
always about the profit right? the profit. agreed, but what do we as fans have to show for it? When I first read this thing elsewhere, I guessed something is cooking underneath. BUT I dont understand one thing…..Why drag Kroenke into it? ARE ex Arsenal players payed to do this (come up with some destabilizing revelations)?? What if Cesc comes up with similar thing tomorrow? There would be a huge uproar. A very damaging one. Why ” drag Kroenke into it ?” …. because he is in it for the cash flow – same as all his other clubs, as I understand it. He is only in it for trophies if it adds to his NET cash flow. And of course we don’t know how accurate any translations might have been but I think Nasri is contradicting himself a bit. First stating that he “would stay” then saying but “Kroenke wanted the money” and then saying: “so I decided to leave”…. Is it still Aprils fools day? IMO it was the correct decision to sell Nasri from a commercial perspective. If i owned a piece of machinery that would be worthless in 12 months time and someone offered me £24m for it, I too would most likely take it. What is also interesting is that here is another player that has realised that the grass is not always greener and it has taken his leaving for him to see the value of Mr W and AFC. Having said that I would have made RVP see out his contract, approaching 30, he would have neeeded to deliver one big season this year to have the same stock as he did at the end of last season. Exactly right. We had that over RVP and kerching, pissed it away for andy bishop’s consolation in our (ha!) “tidy profit”. Plus another gift – this season’s runaway championship cup to Lord Football. ‘With a pinch of salt’ is exactly the way to interpret what most players have to say in media articles, especially ones that come from overseas. As you conclude, there is usually an agenda behind what is supposedly said, and the influence of agents, advisors etc. can’t be underestimated. In talking to a French paper who is Nasri addressing? Certainly not City fans or any others in this country. And the idea of Kroenke personally intervening to force his sale seems highly unlikely. If Kroenke is somebody only interested in the bottom line as many suggest, then micro-management of individual player comings and goings would be out of character. Nasri is another of these players that has’nt moved on and though he won a Championship medal he still regrets leaving Arsenal like they all do.. Move on weasel you was’nt complaining when you were signing you new deal for £150k a week. History, why are we talking about this man anyway??? 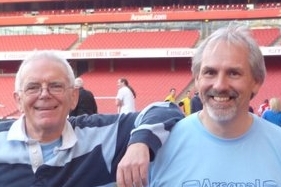 Maybe selling Nasri was more to do about keeping Bernes as far from Arsenal as possibly can? A former convicted match fixer… just imagine what he could do with his players? Arrange something? And it shouldn’t be forgotten that Nasri’s last season with us was pretty mediocre compared with what had gone before. Now history has repeated itself at City. Sometimes it’s all too easy to remember the good past player performances, and to forget the lessor ones. But even in their crap games I loved them. Because they just proved that they are human. Well I hate this greedy fellow Na$ri, but the only point that my mind keeps on racing back to is the fact when this entire saga was unfolding during the summer, Wenger maintained that they would not be sold and apparently he may have resigned about xesc but to agree to sell two of his mainstays in midfield was what all of us found baffling. And knowing Wenger, he would never come out in the public and accuse the owner or the board but I don’t think Wenger agreed to the sell of both Nasri and xesc!!! Kroenke does not see a penny of the profits made by Arsenal FC. The profits of the club stay in the club. AFC the company is a different “person”, legally speaking, to Stan Kroenke. Its money is not his money, so it is hard to see what his incentive would be. You cannot force a player to stay unless his contract is in the protected period. If, as in RvP’s case (and I think Nasri’s case), the time remaining on his contract is unprotected and the player gives notice at the end of the season, the club has to sell him. If such a player wants to go, the club has no choice. I think you are right but as the main shareholder Kroenke could have made the decision that Nasri had to go, if he did no matter what Wenger had said publicly he would have been over ridden and not much he could have done about it. What is interesting is that Wenger publicly said he would not sell Cesc, Nasri or RVP, yet all went. I dont think Wenger is a liar so can only deduce that there must be someone making decisions that ultimatly Arsene has to follow, loigic says that would be Kroenke? Exactly what and where is this statute? Where (in what body of law) does it have standing with the force of law: UK courts, EU courts, FA regulations, FIFA regulations, UEFA regulations? When did this come into effect? At whose behest (was there a case)? Has it ever (yet) been tested in any court? anywhere? Is it immune to a court test if some team actually wished to contest it? Is there absolutely no recourse in or out of the courts on the part of the contract-holding club? Is all and any collusion in advance between a wantaway-player and the wanting-club allowable? At any date no matter when the initial contract was signed? And this is allowable no matter what the level of demonstrable material damage that the contract-holding club might have suffered, or might wish to argue/assert that it suffered? And if all this is legally so, can the player legally refuse the destination to which the contract-holding club decides to sell him? And lastly (Adam, please note) do you know whether RVP or others have invoked this right (nuclear option)? Some evidence for your assertions would add a lot and perhaps put full stop to these endless debates throughout football. And if you can prove this: why, would you say that most fans don’t know about it, and/or don’t mention it in their comments and debates? How do you come to know this, whereas almost no one else here has explicitly cited this as a decisive law (- perhaps with the exception of Adam, who raised this as a possible legal right several months ago)? Why do clubs not simply say out loud to their fans: that we have no legal power to say no. Or is this so totally and well understood that my posing these questions to you displays my total ignorance of the obvious? I’d be happy to learn and, in the process, serve our general level of understanding. But this is a far-reaching claim you make; so please shed the necessary and perhaps conclusive light. Just to clarify, are you further arguing (I think not, but I ask) that a club has no right to hold a wantaway player until the end of the contract? That said, my further (and main argument) has been that we should have said NO, that is, to let the contract expire, and then see what’s what. Facing 30 and with a chronic injury record, RVP could not have afforded to turn in a piss-poor season, nor to have been a disruptive clubhouse figure, without seriously risking the disfavor of potential future (post-season) suitors (at his asking price). In sum, whatever his legal right, there was still a choice on the part of this club to NOT let him go BEFORE the contract expired. And, to me, that was a strategic/tactical blunder. A refusal to recognize we had the whip handle on his future. A bowing down to the low-hanging fruit of 24M, which would have been counterbalanced by the 30M of a CL finish and the incoming mega-TV deal, and posed a serious run at the championship. It was affordable to say NO to this wantaway collusion with MU, and, in any event, the choice has wounded us this season (of being out of contention before January) and has gifted a runaway championship to Lord Football. Let us pray that there’s no mandatory paying homage to the new champions on the Emirates own turf. b) Not spend decades managing in professional top flight football, but still be able to offer an opinion on whether a player plays crap (periodically, most of the time, intermittently, whatever and etc.) even though one isn’t at training everyday or has made 10,000 substitutions before. ….and still be a supporter of the club. Because often it seems if someone here thinks an AFC player plays crap (regardless of how infrequent/ often), or doesn’t contribute much especially given the resources applied to them; and said person states their case without nasty insults, “hatred” whatever, but in a rational intelligent manner… to many here these are seen as impure supporters. Or is it only acceptable to muse about these thoughts after players have left, even though clearly the thoughts were genuine when they were here? And qualify it with an “but I loved them” after said critique? Also most of the pragmatists who are well, pragmatically critical of player performances for the club they love, actually don’t/didn’t think the greats were infallible, likewise for the manager. Just curious since, questioning what is true support or not, especially in the light of unconditional lack of critique players regardless of performance, seems to be a recurring theme on UA. Past player comments shouldn’t be categorically dismissed because they do afford some insight into the inner workings, nor should they be categorically accepted because biases/motives come into play. Picking out the value in them versus the fluff is the difficult part. Arsene said once that there are three things that need to happen for a transfer to go through. Unless all three are in place (above assumes a player is still under contract of course)then the transfer does not happen. I think Nasri was good business, but as detailed by Bob, RVP’s case was different and it would have been good to make him honour his contract. Chris…so you are saying that Barcelona bought Cesc even though he had no tactical know how? I believe that Na$$ri has realised what a terrible decision (football wise) he made leaving our club and our manager. Chris, you so want to put Arsene down at every opportunity, so you simply choose to ignore what Cesc and Na$$ri are saying…Arsene Wenger is the best manager they have ever played under and he taught them everything they know about football. Van Pursy has said that Arsene and old blue nose are fantastic mamagers and the list of ex players praising Arsene go on and on…Hleb, Henry, Bergkamp, Adams, Dixon, Campbell, Vieria, Pires etc etc etc etc etc. If what Na$$ri is saying is actually true, then why not vent your hatred on the man he named as selling him on..Kroenke?? Perhaps you want O’Neill here now? Be carefull what you wish!!!!!! One point seems to be overlooked in all this furore about Nasri’s leaving. Arsene Wenger would never countenance interference by anyone on the Board over the sporting side of Arsenal FC. That is just not his style. He would accept decisions on the availibility or otherwise of funds but once a player was signed, the responsibility was his and his alone. No! Nasri decided to leave for more money and silverware and Wenger never wants to retain an unhappy player. I am going to confess that I am not one who spends every waking hour thanking the Gods of modern day football ownership,for giving us the bounty that is stan kronke, but if he was behind nas being sold, in the circumstances, I cannot blame him. I believe, but cannot back this up, that wenger would quite happily held at least two of the recent and foremost want away three to their contracts, possibly fearing losing out on the top four and not having confidence in himself and the club to make adequate replacements, at least during the summer of cesc. I also believe mistakes in recruitment were made resulting from that summer, though we did get arteta in mf .But that’s in the past. With maybe one exception, things seem to have been put right on that front lately..if however stan stopped reinvestment from that money, that is a different matter altogether, but I am not aware of any such evidence. Regarding the argument about whether clubs have a choice when a player wishes to leave it is necessary to differentiate between legal and practical aspects. Sure a contract is a contract, and if active can only be terminated with agreement of both parties. But in real terms retaining a determined and unhappy player carries potentially more risks both financially and from a playing aspect. Take the case of Modric down the road. Levy was praised in the media for taking a stand and forcing him to stay for another season. Yet any Spurs fan will tell you that Modric wasn’t at his best in that time and there was a feeling of negativity towards him from the terraces, following his refusal to play in their opening match. The effect in the dressing room can hardly have been positive. Having rejected bids up to £40 million from Chelsea (who then ironically deprived them of a CL place subsequently and thrashed them in the FA Cup ). Modric was then sold to Real for £33 million. Good from a playing aspect? Good business financially? Sure clubs have a choice but I can’t think of any cases where an forcing a want-away player to stay has been clearly justified. That’s why it doesn’t happen very often. Well said Stroller, you know it makes sense!!! Why are we wasting time on a prat? It beggers belief! He is certain to come out saying he never said this & that and it was the translation that was wrong. Lets get on with more pressing matters, shall we? With RVP things were slightly different, the guy was after his last contract, he was injury prone and approachinbg 30, had he been made to stay with us he would have been forced to deliver on the pitch to keep his value. Yes the RVP circumstances were different. But the contract negotiations had stalled for whatever reasons. £24 million now or nothing the following year? Even if he hadn’t delivered to the same level as before, a fee-free RVP would still be snapped up by a top club even at 31, especially as he has stayed injury free. Now who is in charge? An externally visible action like refusing a player move may impress us outsiders and make us feel better, but I’m sure there are countless situations within the club on a day to day basis where authority is made very clear to equal effect. We just don’t see them. Mahdain, you crack me up. I have been wondering where he had got too? And we got Howard Webb for the West Bromich game. Mike Dean is back this weekend for the Manchester Derby. @Walter, what are the stats for Andre Marriner with regards to Spurs and Everton. Sorry Untold for going blatantly off topic with my comments, Dowd gets QPR Vs Wigan. No point in playing this match as we already know the outcome. @Walter any chance of you putting the stats together for these games that I’ve mentioned? Mahdain, All the new refs need keeping an eye on. I don’t trust any of the F***ers. We need to see Webbs stats for West Brom. Webbs good for us if we’re playing Liverpool but I’m not sure about Webb & West Brom. Have to wait for the match preview. Looks like Chelsea and Man city are getting screwed by Mike Riley. Dean doing the Manchester derby might be good news. It could mean no Dean for the MU game. But then he will get another one. Can’t be Everton. Wouldn’t be surprised if it will be QPR to stop us almost at the last hurdle? Or has the PGMOL finally had enough of Dean and Arsenal???? The WBA numbers are no secret for me. And I can imagine WBA supporters shaking their head if they would know them… Webb is a real Dean-ref for them. Marriner is a decent ref for them. Both Spuds and Everton are close to their average win %. Manchester teams have a high win %. In a few weeks time you will find all those numbers in a blink of an eye on Untold! Yes, sorry Walter I did find the Spurs & Everton stats, seems to me we are getting an easy ride from Riley. What’s the catch? The Everton Spurs game should be a good game to watch. Plus our all important game in hand is against Everton, I wonder who we will get? Cannot wait to be able to cross reference all the games and refs. 1- This was not known before this season. Last season was the first o the RVP injury-free seasons. He did pose a risk, as so many here banged on and on about in justifying his sale after the fact. 2- Ok, take ManCity last season: Teves and Balotelli had multiple stand-offs and blowouts with Mancini, but he said NO to their wantaway demands and they won the championship. Does this example at all put a dent in your certainty? What is with the Arsenal blogging community? Do we have to put our own team (as a whole and individual players), the manager, the coaches, the owner(s) down all the time? What’s next, some blogger is going to rag about some secretary in the Arsenal organization? Some idiot blogger put up an April Fools thing yesterday. Nominally that a contract between the _real_ big clubs in the EPL and Arsenal was nearly finalized, whereby Arsenal would become a formal feeder club for all players who were capable of playing at the highest level. I can see a ManU, ManC, Chelsea, Liverpool, Tottenham, or possibly even Everton supporter putting this up. No, this article was by an Arsenal “supporter”. I really think AFC need to start launching unauthorized use of Arsenal trademark lawsuits at some of these idiots in the blogspace. imagine them sending Dean to do the Wigan game…? First of all I spelt my own name correctly (wireless keyboard strikes again). Dean and Wigan, something is not right there Walter. I think he will get our game with them. However Dowd for the QPR Wigan game is still a favourable shout for Wigan. Mahdain, It’s mad that we think this way, instead of being able to enjoy all football matches as an equal competition. Mind you I still get lost in a game of footie, in fact I’m missing two champions league games, I’m off. On Cesc, Wenger doesn’t pay attention to what other managers intend to do (you can see why, preparing for the other team doing A and then they do B leaves you unprepared, you have to ensure they do A, by monopolising the ball for instance). On Nasri, as I understand it, the intention was to buy Cazorla to replace Nasri (and make a small profit) but Malaga stepped in with a higher offer. On the face of it, £24m for Nasri when you can get Cazorla for £18m is a joke!